If the first look at the 'new' RoboCop costume below, reminded you of some bland sci-fi outfit usually given to dispensable background henchmen, rather than the lead hero or anti-hero, you are not alone. 5) Give him a cyborg dog Not like any puny Alsatian or cute endearing icon designed by the merchandising or marketing folks. Give him a panther sized partner that'll chew the face of crime and spit down it's throat. 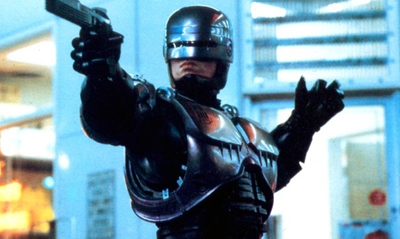 Yip, a feral canine by his side would deffinitely stop this RoboCop suit being a dog's breakfast. 4) Shadow Melt If his suit is going to be all black, dont just have him as 'Motorcycle Batman' - give it purpose! Able to become invisible and intangible in the dark city streets, RoboCop can now show criminals the shadows are no place to hide. 3) Combinable RoboCops Lead by the main man, the other less experienced Robo's in the squad can either follow the word of their commander and attack one-on-one or using the technology of their new bodies and moves no human limbs can match, combine to become one giant RoboCop ready to tackle any sized crisis! 2) Put Wolverine in it. Heck, if the new suit looks like it might effect audience numbers, there's no reason for a moderate fee, why you can't take a leaf out of Marvel's book and throw Wolverine in for a sure-fire hit of attention. Not only is Hugh Jackman a natural at the role, Logan is used to taking on 'iron men', so it's not like he needs rehearsing time! Seriously, of all the things the franchise had to offer, was the original look that broken? oh great, this really makes my day. by the way has anybody out there seen the new Total Recall? I too hope more color will be added to the new suit, but otherwise I'm actually liking it. Yeah, that statement surprises me too, as I'm usually a stickler for the original. And while I'd love it if they just kept the original suit, it's 2012, so of course they're going to have to reboot it a bit. I do like the new mask though, as it gives almost a full view of the face, but doesn't in some angles. Really nice. Funny suggestions, but the dog one actually isn't that bad, and makes a bit of sense actually. And not me Shlomo. I liked the original, even though it was no Oscar-worthy masterpiece, it was still okay that way. You know what's really funny is that I saw this suit without knowing that it was the new Robocop and thought "Hey, someone did a really awesome Mass Effect cosplay, but they forgot the N7 logo"
No kidding. That's what I was thinking. Doesn't look so much like a cyborg as a guy in a suit of armor. Thanks folks! Yeah Dale, this post started out pretty tongue in cheek , but then as I typed some ideas actually seemed pretty sweet. Plus I had to work in cool robots - the scene in Terminator 2 shown above was the most mind blowing thing I've seen on screen for it's time. Sorry Dave I haven't yet. Random, I'm with you. 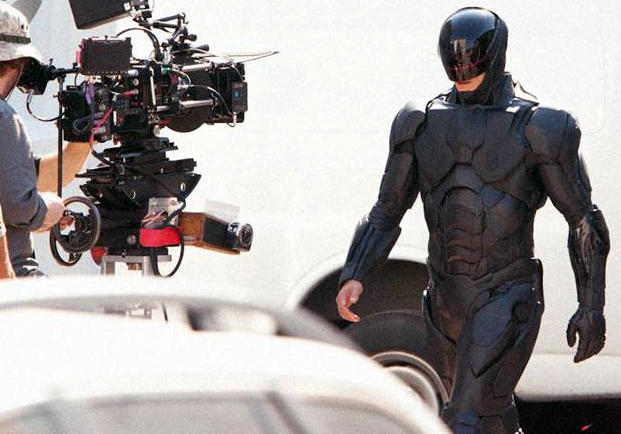 It just doesn't look like a robo-cop, as much as it does a S.W.A.T suit for a regular guy. Creators must hate judgement being past without seeing the final piece in action after post production, but so far this hasn't ticked too many boxes for me. hey Dan ya bugger how about a bleedn splash page!? haha hey Dave, I was going to make NTWICASP (two finger typists love abbreviations) to bi weekly so the novelty didnt wear off. but as requested ill post the next one tomorrow for ya!